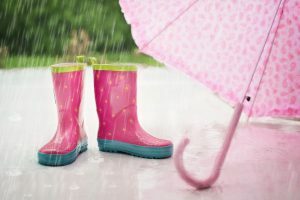 We all know the saying “April showers bring May flowers” but have you ever wondered how to measure a rain drop? There’s always water vapor in our air. Sometimes it collects in clouds and then, when it gets heavy enough, falls to earth as rain. Most people think of raindrops as tear-shaped. But a French scientist, who filmed falling droplets, found that air resistance causes raindrops to change shape as they fall. He documented large, round drops that flattened as they fell, growing wider and then filling with air like a jellyfish or a parachute . When the parachute inflated, the drop burst apart into smaller droplets. All of this activity happened fast, too – within 6/100 of a second. So how big are these raindrops when they finally reach us? Meteorologists – scientists who measure such things – say that raindrops range anywhere from 1/100 of an inch to 1/4 inch in diameter. You can measure your own raindrops. Fill the shoe box lid with flour and use a ruler to smooth the top so it is level. During a gentle shower, hold the shoe box lid out in the rain until about 15-25 raindrops have fallen into the flour. Bring the lid inside to see what you’ve found. Flour absorbs water, and since the flour is a powder it will hold the shape of the raindrop together. Now set the sieve over the bowl. Carefully pour the flour from the lid into the sieve, shaking it gently. This will sift flour into the bowl and leave the raindrop lumps behind. Gently pour your flour-preserved droplets onto a sheet of paper and measure them.